Latest projects always displayed first, on top of the page, descending. An autonomous process for detection of endpoints and transportation of objects. The project was centered around a flying drone and all the necessary components to produce a complete system which could operate all by itself. Resources from the mechatronics and electronics programmes were joined to make this project happen. Bachelors project ELE300 at UiA. A graphical representation of the elektrical installation of a MakerBot 3D printer. The original diagrams to perform the setup of the elektronics on the Makerbot printers was lacking and I designed a new styled infographic like overview of all the connections. Illustrations for all the recents printers are available, including Makerbot Thing-O-Matic MK4 and up to the latest Makerbot Replicator MK8. 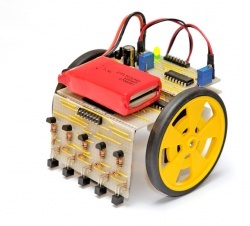 The main objective of the project was to implement a robot which could be wirelessly controlled but operate by itself. By using a ATmega1280 microcontroller on an Arduino Mega as the central processing unit, a system was devised to autonomously follow a line and determine the appropriate operation based on detection of crossroads and endpoints. 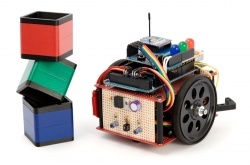 A light color sensor was used to sense the color of cubes in from of the robot. Course ELE212 at UiA. 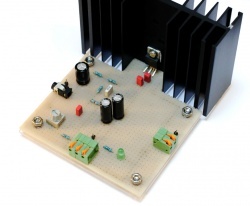 A complete product for filtering noisy power sources by using a LC (coil+capacitor) low-pass filter. Targeted for FPV users (RC airplanes and quadcopters enthusiasts) this filter helps to keep the video stream from the video camera clean and distortion free. It is connected between the power source and the video system, isolating parts of the system from the noisy switching and drive train. PCB designed and manufactured, filters assemblies by hand. Sold in large quantities to vendors. A lab assignment to learn how to use a ATmega128, connected via serial cable, to solve a software labyrinth running in a Java simulator. The trick was to use the coordinates published by the simulator and interpret them in a meaningful way. Control signals could then be sent to the virtual robot to move it through the labyrinth in the shortest amount of time. Course ELE209 at UiA. A small project used to display the current utilization of the locally shared Internet connection. Updated very other second by the network gateway. A shell script talks to a Arduino-board installed with a ethernet shield, sending the download and upload values over to a second Arduino-board, where the values are scaled and shifted over SPI out to 64 shift-registers connected to a total of 128 LEDs. Mounted on plexiglas and powered by 5V 2.5A. Inspired by the cool fact that it’s possible to control each and every primary color on a long strip of RGB-lamps. 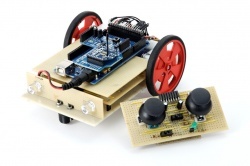 This was a full semester project, the primaries was to use FPGA to control an discrete components analog vehicle. 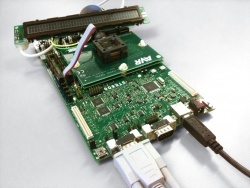 Input were given by a analog joystick, A/D-converted to 8-bit word, processed and command protocol in a Xilinx Spartan-3E FPGA board, signals wirelessly transmitted to the vehicle by Xbee, use LMC6482 op-amps to generate a PWM-signal, controlled by analog signal from an AD7303 D/A-converter, and the motors driven by a L293D four-channel motor driver. Return signals possible. FPGA programmed using VHDL. New redesign of a car company website. Design based on “Den Glade Båtmegler” design, shadow effect devised by Edvard Gjernes, php template programming, MySQL, administration page for adding and editing content ont he site. Find neighboring websites for a given hostname or IP address. Site normalized MySQL setup, Apache with mod_rewrite, objective PHP to power the GUI and secret sauce to fetch the host details. Also puls hostnames from the duggback.com project to replenish the site with new hosts in addition to user queries. The main topic was digital logic implemented by plain old discrete gate components. It was the second project in the electronics circuits course. Triggering on the voltage from an light-sensitive transistor, the vehicle can detect whether it’s positioned over a black strip. The maneuvering is determined by a combinational circuit realized using Karnaugh-minimalization of a defined function. This was a project for an electronics course. The goal was to build an audio amplifier following a set of specifications. Using the LM1875 as the op-amp and accurate resistors and capacitors for the filters. Every aspect of it was calculated and simulated before the circuit was constructed. Measurements were done to verify the calculations and operation. Proof read two chapters of the Windows 7: Missing Manual book series authored by David Pogue, NYTimes fame. One about “Laptops, Tablets and Touch-screens”, the other about “Printers and Scanners”. I double check the logic, looked for typos, and added some suggestions. The book was published 17 March 2010, by O’Reilly Media. Building a RC helicopter from parts and fine tuning it. The electric motor is driven by a speed controller and input from is transmitted on the 2.4GHz spectrum. Triming the rotor head and tail to atthive less vibration and a stable hover. 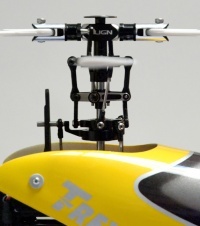 It’s tiny, length 430 mm and flying weight 330 grams. The author of this book mentioned my Eee PC modification project I did 2 years ago. It’s interesting how much attention this project has gathered, quite fascinating. Automate process of getting the latest eAvis (epaper, pdf) version of Agderposten. Short script to parse login and send proper request to server. Later added Aftenposten. Site great for the iPad. Based on PHP shell script to periodically pull for new content, preg_find to sort filelist and show list. Uses some CSS3 (browser) shadow effect. Translates any webpage to a number of languages in real-time. Layout, design, and links are working as normal. Site uses Google Translate as its base, with Apache (mod_rewrite), PHP and MySQL to power the GUI and “*.mk.gd” URI-handling. It was a website to help students get the resources for all the different courses, copyright issues were raised. Interestingly it prompted queries for other projects. Site used front-end based on filesystem-navigation powered by “PHP/jQuery File Tree”, files where mirrored using a background-downloader. A website to offer access to a repository of files related to the Iranian election and freedom issues in Iran. Site uses phpXplorer script, customized to make it more userfriendly and cleaner. A request to recreate the build year digits on side of a refurbished building. The old digits was painted over and only a low-resolution photo was available to base the new vector illustration. Photoshop to make a high resolution model to do retouch, Illustrator to create vector. Sending a SMS message via a cramped mobile keyboard has never made sense for me if I have a computer nearby with a fullflead keyboard. Most cellphone operators offer a web interface to send messages. I’ve create a script that pulls the website to send messages. Three of my favorite channels to interact is covered: Bash script, dedicated website, and mIRC script. Telenor SMS wiki page. Design made for a pizza shop in Arendal. Did the design as a exercisie, try PNG-transparency and layering. Shop didn’t respond to the offer. HTML and CSS design, input and suggestions by Edvard Gjernes. A small client to make it easy for modders (hi Aussies!) to submit new data entries to the Wii Drives chart website. Works by reading the field values in the client and performing a web request to the webserver, client coded in AutoIt scripting language, flexible and easy to get up and running. Website for a small brokerage firm selling new and used boats in southern Norway [Norwegian]. Design based on Zen Garden CSS, top logo designed by Edvard Gjernes, php template, MySQL, administration page for adding new and used boats to site. Comparison web-app based on price data provided by prisguide.no, can be used by a competitor to get an overview of the price differences and competitiveness in each product category. The latest Xbox 360 DVD drive requires a RS232 serial adapter and SATA connection to dump the encryption key. Xbox 360 Lite-On DG16D2S Extract Key page. A database over Wii consoles to gather and estimate the model of the DVD drive chip. MySQL database accepting submissions from web and client utility. Website allows a visitor to filter out entries by drive chip model, serial number, region, country, store, and username. It’s been known for a while that it’s possible to tunnel IP over DNS via the TXT records, this demonstrates how to set up a client-server environment for Windows (via Cygwin) and Mac OS. Test cases also performed. DNS Tunneling page. Modified a double AA Maglite to fit a red laser from a DVD-writer. The laser diode is held by a cylinder laser mount with a focus ring. Pin legs extended to reach the Maglite battery sockets. Maglite Laser page. A good backup routine includes scheduled backups, encrypted, transparent, redundant and off-line off-site storage. Using a network server, SSH, Truecrypt, and rsync, a rather good routine can emerge. Encrypted Backup Routine page. Modified the tiny ultra-portable Eee PC computer to include USB hubs, Bluetooth, GPS module, 802.11n 3-antenna network, touch-screen, internal flash drive, internal SDHC card reader, modem, FM transmitter, temperature sensor, copper heatsinks, and DIP-switch to manage power to the devices. Eee PC page. The Xbox 360 security system prohibits downgrading the kernel to a earlier version because of efuses on the processor, restricting kernels with a lower efuse count to boot. The efuse count is signed but the hash is vulnerable to timing attack by statistically brute forcing each byte using external hardware. Xbox Timing Attack and Xbox 360 Downgrader Hardware page. Scand designs and manufacturers family- and recreational boats. CSS design, integrated content into new design, expanded administer back-end from PC Support to be more like a CMS, TinyMCE for textarea formatting, PHP, MySQL, GD for picture resizing. On-Sat is a Norwegian company offering a tracking and security unit based on GPS positioning and GSM mobile communication. Built CSS design and layout to be integrated into an already existing ASP application, made smaller edits to .NET code for modules to appear correctly, site continually updated. Supplemental website for Digg (digg.com). Makes it easy to find mirrors of websites that has been taken down by excessive traffic or other circumstances. Using the Digg API to supply the latest stories. Database tracking the different DVD-drives (3 models) used in the Xbox 360 game console. Allows to filter out entries by manufacturer date, country, drive, store, and deeper. Based on Intel Mac Temp code, few changes to fit the data structure, PHP, MySQL. Database website collecting the processor temperature from the new Apple computers sporting Intel CPUs. Earlier machines had a design flaw making them too hot for the touch. Code based on PS2/Xbox Drives, rewrote parts of the code, more secure, ImageReady to slice design, PHP, MySQL, GD for captcha. Online presence for a local company selling and repairing computers. Design guideline by Edvard Gjernes, implementation and code by myself. Made new administer back-end, few design changes, PHP, and text database. Front-end for a marine production and consulting company. CSS based design, PHP for contact-form. Another re-configuring of the wireless point-to-point network, moved antenna and equipment from Torvgata to Hylleveien (residents moving out), same setup to provide access to file server and off-site backup server. Promotional video to present the cafe, shown in a 42-inch screen for a month, window space in local bank facility. Worked in team with Edvard Gjernes, edited in Adobe Premiere Pro. Download video (XviD). Website for Lyngaas Trykkeri, a digital and offset printing business. All CSS based design, some PHP code, Google sitemaps. Personal blog for Dan Thomas Marceliussen, a friend of mine. Based on the same codebase as Clux Blog, three modules; postings, links, and photos. Same codebase with minor changes, Gallery for photo management. Personal blog for a friend of mine, Eirik Albrigtsen. Three modules, postings, links, and photos. All new code, made by specifications, PHP, MySQL, NetPBM for photo resize. Re-configuring wireless network, taking down Garden of Sri setup, installing it on top of Planet X-Pec building and pointing toward Torvgata, allowing access to the file server located at Planet X-Pec, and the off-site backup server at Torvgata. Hard drive compatibility chart database for the Xbox and PS2 game consoles. Used for modifying the machines. The same basic site as Panama7 project, only a new design. Still made this for a friend of mine. Gaming team website, battle records, news and activities, and member profiles. Made this for a friend of mine. Only code, lots of new code written, PHP, MySQL, and Clanbase scraping to provide ranking status. Built wireless network using off-the-shelf routers and patch antenna to providing Internet connection from Torvgata and across the street to the other side, configure appropriate IP routing (3 NICs), and local web server. Share and QoS internett connection for 3 residents requiring good gaming experience, SDSL, dedicated Linux gateway with DHCP and internal web server for real-time bandwith monitoring and port-forwarding information. Dan Thomas, myself, and some of the X-Pec team started a Internet cafe in 2003. Website included profiles, comments, game statistics, and live webcam. Complete design, lots of internal pages, PHP, MySQL, some perl CGI. Network configuration for 10 people using the proper equipment, dedicated Linux gateway with DHCP, LAN server for storage, web server for publishing videos via 100 MBit Fastcom Internet connection. My schools graduation website, including news postings, user contributions, photographs, and restricted information for graduating users only. X-Pec team website, latest news and activities, demos, game records, and profiles. Original was based on static HTML, made pages dynamic, PHP, MySQL, and GD image library. A Internet cafe website, including game server status, game server statistics, and auto-update webcam. Made two design updates, static HTML, some perl CGI.